One of mankind’s oldest weapons, the spear long predates recorded history, let alone the Middle Ages, thus it is not surprising that sophisticated spear technique appears in a wide variety of Italian, German and English sources of the 15th – 17th centuries, nor that the commonalities far outweighing the differences. 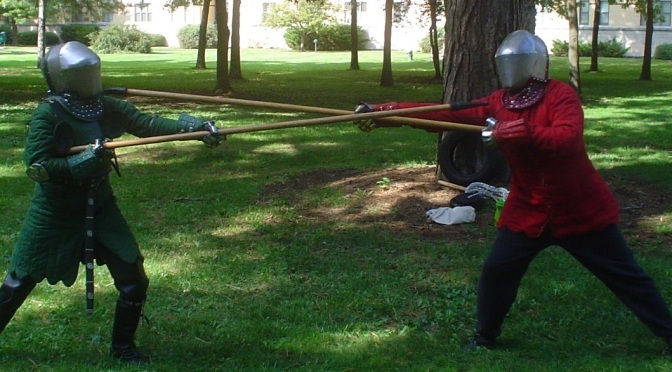 Medieval masters-at-arms clearly differentiate between two forms of weapon, simply designated as “short” or “long”, as well as two distinct sub-styles of spear play. The first method was used with both short and long spears and was for both using the cavalry lance dismounted, and when fighting in infantry ranks on the battlefield. The second method was optimized for using the short spear in single combat, usually within the context of the armoured duel or feat of arms. As such, the thrusts are usually made with the support of the entire body, and the spear is often used like a staff to strike, hook or throw the opponent if the initial thrust fails. Whereas the common method is specifically designed to always stand with the point in-line to threaten an immediate straight thrust, the specialized short spear generally stand with the point off-line. The spear (Italian: lanza or lancia) is a relatively simple weapon, composed of three parts: the point, the shaft (l’asta), and the heel or foot (pedale). By the 14th century the spearhead, also called the iron or pike (It: ferro or pica), was generally made of tempered steel and was kept quite sharp. Spearheads ended in a split, tubular ferrule that was usually attached to the shaft by one or two rivets. 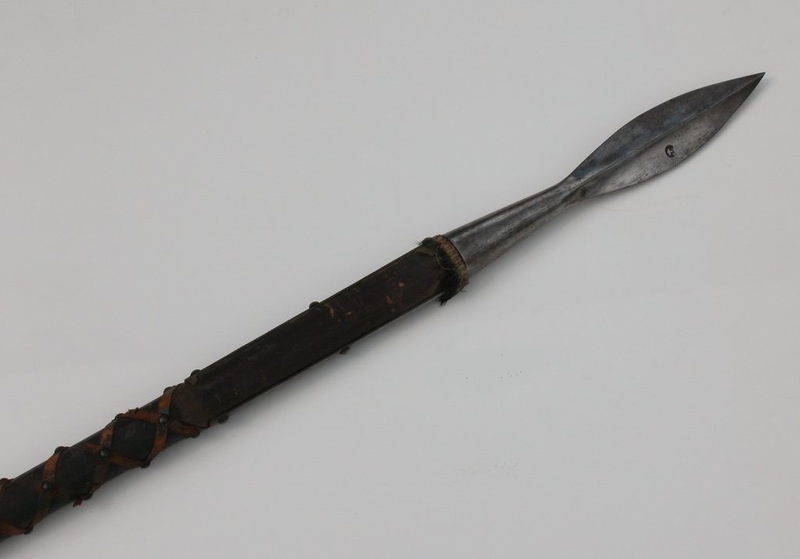 During the later Middle Ages this ferule was occasionally supported with the same long metal strips, or languets, used to reinforce the shafts of heavier polearms. Although this greatly reduced the likelihood of the point being broken off, both the rarity of such languets on surviving spear heads, and the corpus of techniques specifically designed to break off the spear’s head point, suggests that they remained uncommon on this simple weapon. There are numerous styles of spearheads, but generally they were tapering, kite or leaf-shaped, of diamond cross-section with two-edges and a point. A less common form appeared in the late Middle Ages that was lentoid in cross-section, turning the spear into a giant, armour piercing spike. These variants of the spearhead were developed for specific purposes, but all emphasized the thrust. The spear shaft was made of a straightened, round or octagonal hardwood pole, usually of ash. Generally, the haft was thick enough to sustain the weight of the head without bowing or breaking, but it was not nearly as thick as the shafts of other polearms. Haft length varied greatly, but an examination of iconography, used in conjunction with the surviving written advice given by the period’s masters-at-arms, suggests that an average length of six to twelve feet was common for most of the medieval period. Dei Liberi himself teaches the use of the short spear, a weapon that was approximately six to eight feet long. The spear’s pedale, or heel was often shod in an iron ferrule or cap, and Fiore dei Liberi describes his own spear as such. [Getty Ms, 39v.] These caps ranged from simple rings of metal to a tapering conical cap with a balled end. This reinforced the haft, making the heel useful for striking or thrusting if the opponent forced the spearhead out of line and attempted to close.